We are available 24/7 to provide you with a free price quote for our service. Just contact 020 3746 1366 or use the online contact form right away! Ashlee House Cleaning offers the most modern and efficient carpet cleaning methods, safe and suitable for synthetic or natural carpet materials. 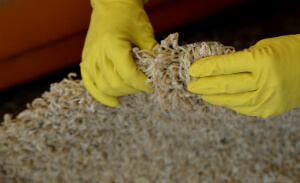 The experienced and background checked cleaners examine the carpet to determine its particular type and condition and perform tests of all the detergents that will be used. Then they will continue with the deep carpet cleaning. After the rug or carpet is hoovered, the stains and heavy traffic areas are pre-treated with suitable solutions. Then steam carpet cleaning or dry carpet cleaning is done to sanitise and rejuvenate the carpet. Steam carpet cleaners use a powerful hot water extraction machine, while dry carpet cleaners use a dry compound for carpets that are delicate and moisture-sensitive. Both methods that we offer in Bow Road E3 are safe and efficient. Ashlee House Cleaning provides top quality, reliable and affordable rug and carpet cleaning in Bow Road E3, suitable for residential and commercial properties as well. We are constantly investing in hiring the best cleaners and personnel, as well as in buying the latest and most modern professional cleaning technologies, tools and Prochem certified solutions for cleaning, which are tested and perfectly safe for people, animals and the environment. Our cleaners all work in accordance to the safety and quality procedures which we have implemented, as well as the detailed cleaning checklists which we have developed for every professional cleaning service which we provide. Our company is a professional cleaning services provider which is strongly interested in reaching 100% customer satisfaction. We spend most of our financial resources and time in ensuring that our carpet cleaners in Bow Road E3 are properly qualified and well equipped with state-of-the-art cleaning tools and machines in addition to Prochem eco-friendly and safe cleaning solutions. Our carpet cleaning service is done in compliance with our safety and quality procedures. We can have all types of carpets perfectly cleaned, even the most delicate ones, such as luxurious Persian rugs, antique rugs or silk rugs. We offer fibre protection upon request by applying a powerful stain protection layer after the cleaning. To get the top customer support service and the finest carpet cleaning around, book our professional rug and carpet cleaning service today! Dial 020 3746 1366 or send an online request via our contact form to reserve time and date for our services provided by our carpet cleaning experts in Bow Road E3. Your request will be received and processed in no time and you will receive a text and email confirmation for your booking. We have budget-friendly prices and we clean also on bank holidays and weekends. When you book several of the services we offer at once, you will not only save time but you will save money because we will make you discount off the price. No advance payment is needed for booking any of the services we provide.